Looking for a Used Metris in your area? CarGurus has 1,446 nationwide Metris listings starting at $16,848. Calibrated to deliver the smoothest and most comfortable ride possible for passengers, the new Mercedes-Benz Metris nevertheless rewards the driver with unexpectedly responsive and engaging dynamics. 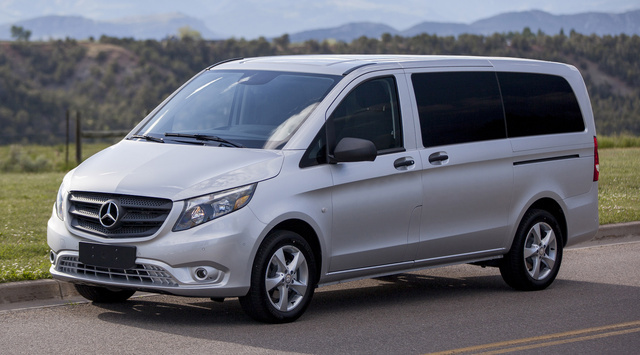 Designed for commercial use, the new 2016 Mercedes-Benz Metris might pique the interest of consumers who might otherwise buy a traditional minivan. Pricing overlaps with those useful family haulers, and while the Metris can solve for certain personal-use transportation problems, it is not the better choice for most of the people, most of the time. Plus, like any luxury-brand vehicle, it lacks a strong value equation. As a division of Daimler AG, Mercedes-Benz builds a full range of cars, vans, trucks, and buses that are sold all over the world. Americans, however, equate the brand’s unmistakable 3-pointed star ornamentation with wealth and success. You can imagine the confusion at the school drop-off line, then, when I showed up in this refrigerator on wheels, the new 2016 Mercedes-Benz Metris. Intended for commercial rather than private use, a generously equipped Metris is priced in the same neighborhood as loaded versions of traditional minivans. But don’t get too excited. Like any Mercedes, with the Metris you’re paying more to get less. Still, given consumers’ apparent willingness to accept this state of affairs in other segments, I wondered if perhaps the few remaining minivan enthusiasts on the planet might be willing to swap equipment for the prestige of Mercedes ownership. My brother-in-law loves his Honda Odyssey. He’s got two kids, he fishes, he camps, and he thinks his minivan is the most awesome family car of all time. So I brought the Metris over to his house. He and my sister-in-law checked it out, and after they formed some opinions, I shared details, including price. “So, would you pay the same amount of money for this Mercedes as you would a loaded-up Odyssey Touring Elite?” I asked. The answer from both of them was no, because she didn’t like the styling and he didn’t like that the third-row seat doesn’t fold into the floor. Neither were happy about how “unfinished” the interior looked. Believe it or not, you can buy a Metris passenger van for as little as $33,495. You won’t want that one, though. You’re going to want one outfitted like my test vehicle, if you want one at all. Body-color bumpers, carpeting, cruise control, a reversing camera, and aluminum wheels cost extra. Add them, all contained in option packages that also include a navigation system, upgraded interior lighting, and a comfort-tuned suspension, and the price rises to $38,130. Having spent a week driving the Metris, I know that you are going to want the Active Safety Plus option package, the one that includes front and rear parking sensors. Trying to drive one of these vans without the critical parts of this upgrade — heated side mirrors, parking sensors, and a blind-spot warning system — would prove challenging. This package also includes rain-sensing wipers, a collision prevention system, and a lane-departure warning system. Now the Metris costs $40,325. A high-performance air conditioning system is recommended for humid and hot climates, so budget a grand for that. Then, install power sliding side doors on both sides of the van, swap the barn-style rear cargo doors for a traditional liftgate, trade the handsome cloth upholstery for black leatherette, install heated front seats, and the final tally rises to $43,985. Compared to a similarly priced traditional minivan, it's clear that you’re giving up amenities when you buy a Metris instead of an Odyssey, Sedona, or Sienna. Perhaps more significantly, you can’t option this Mercedes to the same level as a leather-lined Honda, Kia, or Toyota even if you want to. Not from the factory, anyway. Plain and slab-sided, its Artic White paint doing it no favors, my test Metris raised eyebrows and caused looks of confusion at my kid’s school, because it is obviously meant for airport-shuttle rather than family duty, yet it wears Mercedes emblems like an ill-fitting Halloween costume. Ever see a BMW 320i with M badges slathered all over it, or a Mercedes C250 rocking multiple AMG badges? From a moderately intelligent peer-group’s standpoint, the same pathetically shallow and pitifully insecure mentality that leads to such choices hangs over the Metris like a shameful umbrella. Even when purchased for its intended use as a commercial shuttle van, the Metris struggles to deliver value. 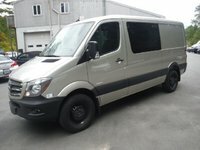 Price out a loaded, low-roof, regular-length Ford Transit XLT, and you’ll get a bigger and less-expensive van with a broader array of features and greater ability to tailor it to specific business requirements. The Mercedes, though, is much better looking than the Ford. Each boasts European sensibility in its design, but the Metris looks sleek and aggressive, whereas the Transit is gape-mouthed and wide-eyed. The Ford’s hose-me-out interior also stands in stark contrast to that of the Mercedes, which presents a tailored and sophisticated ambience. Thus, it becomes clear what the Metris is for. Not just shuttle duty — executive shuttle duty. Although built to carry lots of people, or haul lots of stuff, or tow nearly 5,000 pounds of trailer, the Metris is equipped with a turbocharged 2.0-liter 4-cylinder engine. 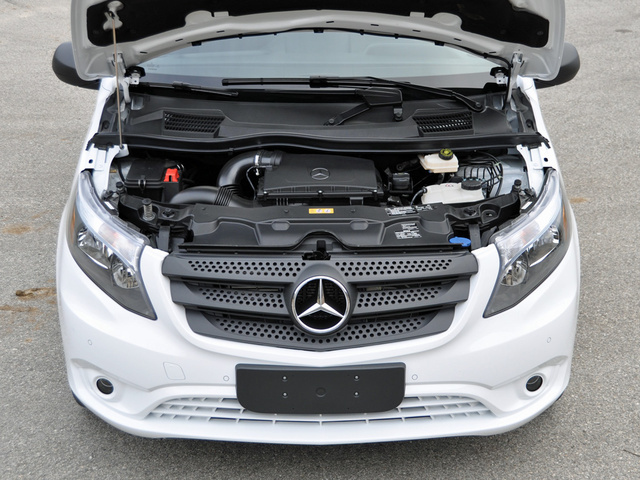 This is a workhorse engine for Mercedes-Benz, offered in a wide range of the company’s products, and it makes 208 horsepower and 258 lb-ft of torque in the Metris. A 7-speed automatic transmission powers the van’s rear wheels. Optional automatic engine stop/start technology is supposed to improve fuel economy. In my experience, it did not, as the Metris returned 19.9 mpg in combined driving compared to the official EPA estimate of 22 mpg. Calibrated to deliver the smoothest and most comfortable ride possible for passengers, the Metris nevertheless rewards the driver with unexpectedly responsive and engaging dynamics. The engine pulls willingly, cruises effortlessly at 80 mph or greater, and climbs mountain grades without trouble. To be fair, though, I did not load the Metris with the people and cargo it's designed to carry. Steering is fluid and perfectly weighted, and the Metris boasts a tight 38.7-foot turning circle. Serving as the most obvious tie to the aspirational luxury cars sold by Mercedes-Benz, the steering wheel is a genuine joy to hold, but is offered with only tilt rather than tilt/telescopic adjustment. Responding in linear rather than progressive fashion, the brake pedal feels numb and unresponsive at first, with pressure building in direct proportion to how hard you step on the brake. At first this bothered me, but I realized that this is a deft calculation designed to make passengers more comfortable without any loss of braking capability. In other words, the way the brake pedal works actually helps the driver to drive more smoothly. With the optional comfort suspension, the ride is soft and smooth but not wallowy, and the driver still receives important feedback from the road surface. On a twisty mountain road, the Metris even feels a bit tossable. Rough pavement, however, does create numerous rattles in the cabin. Hard plastic is used throughout the Metris’s interior, but given its intended purpose as a work van, this isn't surprising. With that understanding, surfaces and finishes reflect quality, and from how the windshield pillars are finished to the Berber-style floor mats, the Metris impresses as a thoughtfully outfitted vehicle. It would be nice if the passenger version of this van had soft-touch upper door panel trim or at least a padded door armrest. Simple, intuitive knobs and buttons mixed with unnecessarily obtuse infotainment controls characterize the Metris’s cabin. Plus, the cruise-control stalk is invisible, hidden behind a steering-wheel spoke and located just under the turn-signal stalk; I unintentionally activated it at least once. Rear-view mirror visibility is awful because the rear center seat headrests completely block the view. A car could be directly behind the Metris, and the driver would never know it. Seat comfort is excellent, no matter where you’re sitting. The inboard front seat armrests automatically return to their previous position after raising them to buckle the seat belts, and both rear rows of seats feature tall, upright, and supportive seating with plenty of legroom and foot space. 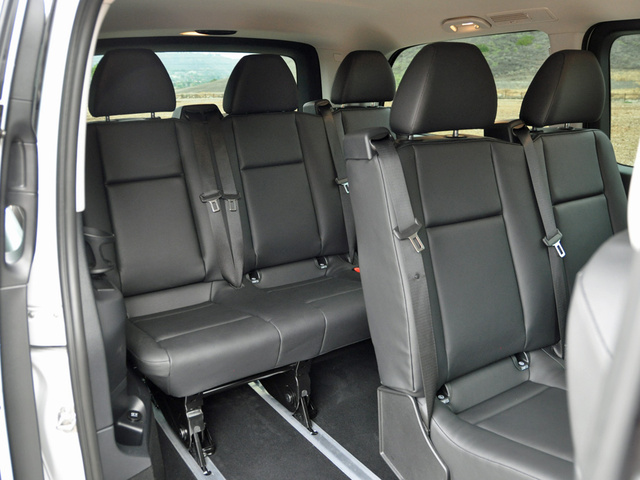 Access to the third-row seat is super easy, especially with the 7-passenger seating arrangement. 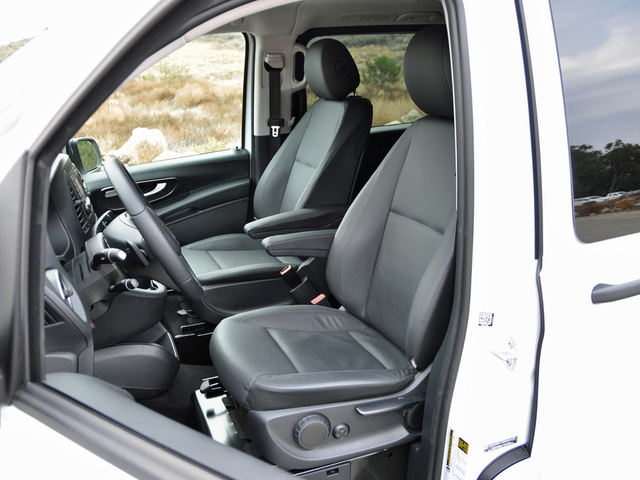 An optional folding seat expands the second-row seating area to 3-passenger capacity, making this a true 8-adult-passenger vehicle. No minivan can touch it. 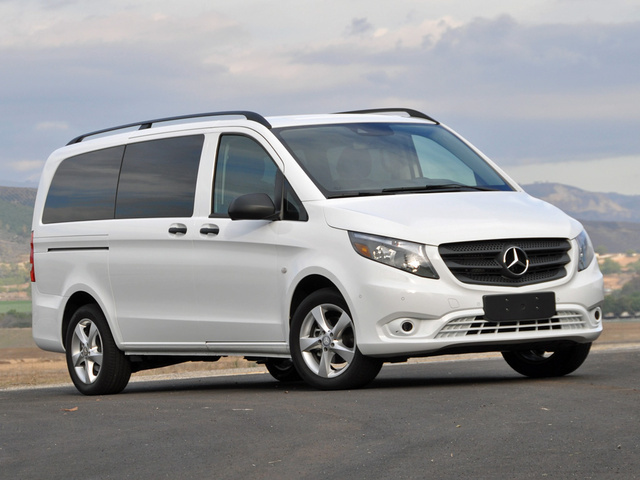 Mercedes-Benz says the Metris holds 38 cubic feet of luggage behind the third-row seat, and an optional cargo net allows for safe loading to the van’s ceiling. Both rear rows of seats can be removed to expand capacity, but they are heavy and require at least two people to unlatch, lift, and carry them to a storage location. 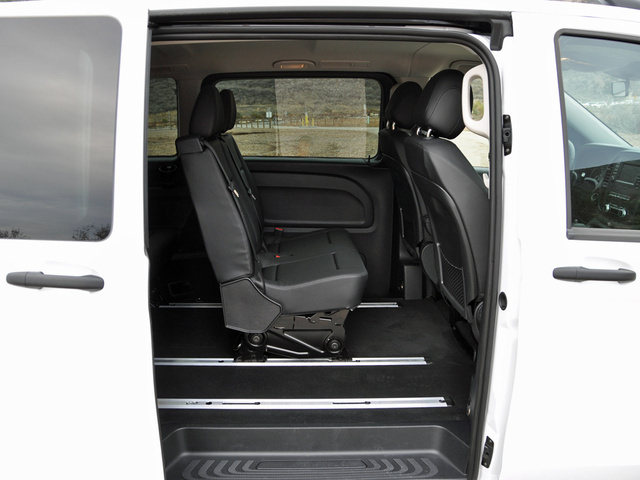 Based on the maximum cargo volume given for the Metris cargo van, it can carry substantially more than a conventional minivan with its seats removed. Note that in order to open or close the liftgate, the Metris needs a fair amount of clearance. A strap is designed to help shorter people to pull the liftgate down, but shutting it tightly requires placement of a hand on the dirty exterior surface in order to slam it shut. Although the Metris is offered with a number of standard and optional safety-related technologies, it certainly falls short in terms of its infotainment system. Equipped with a small 5.8-inch display that is not touch-sensitive, the infotainment system offers Bluetooth connectivity and a USB port, but little beyond an optional navigation system. Meh. Furthermore, the system is distracting to use. The driver uses the buttons to the upper left of the screen to choose a primary function, such as “Radio” or “Navi” or “Tel.” Then, the driver uses buttons and a knob to the lower right of the screen in order to select menus and make in-menu choices. In my experience, the buttons and knob sometimes produced unexpected results, suggesting counter-intuitive operation. An Active Parking Assist system is available, included with front and rear parking sensors. Using this system, the Metris can identify an appropriately sized parking space and then steer itself into the space while the driver operates the transmission. Mercedes says the system “provides brake assistance.” I did not test this assertion. Safety is important to Mercedes-Benz, and so the Metris comes standard with or is offered with a number of driver-assistance technologies that are designed to help reduce accidents. Standard equipment includes a drowsy-driver monitoring system called Attention Assist and a vehicle stability system for windy days called Crosswind Assist. The stability-control system is load-adaptive, too, which means it recalibrates depending on the amount of weight inside the van and how that might have changed the center of gravity. A reversing camera is optional, but not as useful as it could and should be, because the lens is angled too far down, obstructing the view. In wide parking-lot aisles, it is hard to see if vehicles across the aisle might also be preparing to reverse. The rear parking-assist sensors sounded a false alarm each time I backed out of my driveway. My test vehicle also had a forward-collision warning system, which sounded an alarm just once as I approached a vehicle that was moving into a left-turn lane. The lane-departure warning system sent signals as vibrations through the steering wheel, a subtle yet effective format that encourages the driver to keep the system engaged. One of the most irritating things about driving the Metris relates to the van’s side mirrors and its blind-spot warning system. First, the side mirrors are like those on a car, mounted rather low with wide reflective surfaces. The one on the right also appears to magnify objects so that they appear closer than they are. I found the mirrors to be too small and difficult to adjust properly for all situations. Taller mirrors would be better, with separate parabolic surfaces at the bottom for seeing in the van’s substantial blind spots. If the blind-spot warning system worked better, my complaints about the side mirrors wouldn’t be quite as strong. However, I found that vehicles in adjacent lanes could briefly hide, not showing in the side mirrors but also not activating the blind-spot warning system. Given how poor rear visibility is through the rear-view mirror, Mercedes needs to improve the side mirrors and blind-spot warning system as soon as possible. A new model, the Metris had not been crash tested by the federal government or the Insurance Institute for Highway Safety (IIHS) as this review was published. Given that the Metris earned a residual value award from ALG for the 2016 model year and the van is engineered for work instead of play, chances are excellent that it will be dependable and worth a good chunk of change as a used vehicle. Beyond this, though, the Metris delivers a sketchy value equation in terms of amenities per dollar, and during my week of testing, it missed the EPA’s official fuel economy estimate by 2.1 mpg in combined driving. And that was with no more than my wife and young children along for the ride. 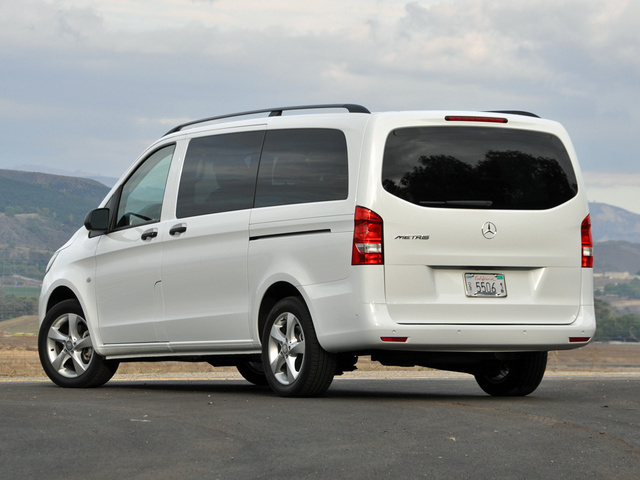 From a personal-use perspective, unless you have specific vehicle requirements that only the Metris can meet or you’re an avid fan of the Volkswagen Microbus or Vanagon and wish VW had built something like this Mercedes instead of that crappy Chrysler-based Routan, you’re going to be happier in a traditional minivan. That’s because the Mercedes-Benz Metris is designed for commercial use, not personal use. It is not luxurious, it's not loaded with amenities, and it's not a great value compared to a similarly priced Honda Odyssey, Kia Sedona, or Toyota Sienna. With that said, I could see someone choosing the Metris instead of a basic Chevy Tahoe or Suburban, especially if they never plan to tow anything and don’t care about the Dustbuster styling. I could see someone choosing the Metris if they need roomy seating for a family of five plus a huge, square, secure, and weatherproof space for cargo or large dogs. I could see someone choosing the Metris if they simply want to drive something different from what everyone else has. 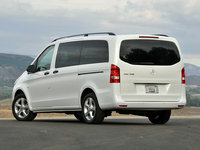 Otherwise, you’re going to want to leave the Mercedes Metris to shuttle companies. I’m sorry: executive shuttle companies. What's your take on the 2016 Mercedes-Benz Metris? jamesfduncan Have the cargo version which is lighter and sprung for bigger payload. My use if for dog and personal transport of bicycles/car camping. I ordered a loaded version and it's ideal as I traded a low-mileage Odyssey in, being too plush. I get 25+ mpg in city and 30+ on road with eco-mode and start/stop. Love the wash and wear interior. Perfect truck for me though granted it's "off label" use:)! Aaron Hi James, thanks for your post, our family is looking for the exact same purposes. 3 bikes and camping gear hauler. Love the doors in the back that swing 270 degrees. Looking for Master Upfitters in our area to add rear window and 2nd row seat (who needs a third row where the gear is). Our family is still trying to decide to ruin a plush Model L Sienna or have a vehicle built for the purpose. Thanks again for your post, all the best in your adventures! Users ranked 2016 Mercedes-Benz Metris against other cars which they drove/owned. Each ranking was based on 9 categories. Here is the summary of top rankings. Have you driven a 2016 Mercedes-Benz Metris?